Sometimes, it doesn’t take much to change the course of history: a bullet, a stab, a flea… a handful of French settlers. Historians agree that the fall of New France encouraged the rebel colonies in New England to seriously plan a revolution. 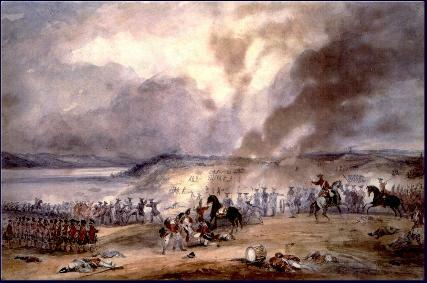 It has also been said that the continuation of the French settlements in Canada precipitated the French Revolution. As Voltaire pointed out, the money spent on Canada would have been better spent in France to alleviate the miseries there. If only. At the end of the French regime, the population of British colonies in North America was about a million compared to Canada’s 70,000 at best. So, the inevitable happened in September of 1759 when those in charge of attacking and defending, 32-year-old British General James Wolfe, and 47-year-old French General Louis-Joseph de Montcalm, were mortally wounded the same day on the battlefield in Quebec known as the Plains of Abraham. Within the week the governor of Quebec surrendered the city to the British. The rest was skirmishes and capitulation... Trois-Rivieres, then the incredulous Montreal who would not surrender until September of 1760. Whatever participation my family would have had in the defense of Canada was probably not heroic, although it would seem those living in the Trois-Rivieres area were probably members of some militia or another. By way of explanation, Therese Chauvet was the daughter of ancestor Andre Chauvet dit Camirand and Anne Pastourel, and the sister of ancestor Pierre Chauvet dit Camirand. She was born in 1716 in Canada, so would have been about 44 when she sailed for to France. It is not known whether she had children who would have followed her back to France. On a spring day in June, 1759, the grandsons of Guillaume Lizot who would be in my family, and the grandchildren of the Heroes of Riviere Ouelle who were living in the Riviere Ouelle area surely watched the flotilla of British warships cautiously making its way up the Saint Lawrence River to lay siege to Quebec City. The document that made it all official was known as the Treaty of Paris which was signed in February of 1763. In it, Article IV provided protection for the French of Canada… their religion and language would be allowed and they would have 18 months to return to France if they so wished. However, the British soon implemented a policy of assimilation to control the French. In it they prevented Catholics from holding public office and forbade the recruitment of priests and brothers, effectively shutting down Quebec's schools and colleges. This lasted from 1763 to 1774 and was an utter failure. This is not the final chapter of the story. French Canadians as a people and a culture would prevail and from the middle of the 19th century through the early part of the next century, nearly a million, my family among them, would migrate to the United States seeking work... but this will be the subject of a new site.